March 11-17 marks Sunshine Week, the annual tribute to freedom of information. Patrick Conant, an Asheville-based web developer, will be doing a little extra celebrating this year as he marks the first birthday of a tool he and colleagues built to open the flow of local government data to citizens. Inspired by a public-records workshop, a few years ago Conant starting requesting government documents—everything from the salaries of public officials to the e-mails they swapped about important local policy decisions. “Then, I started wondering how to build a platform where people could request records anonymously, then share the results with other people,” he says. The result was www.SunshineRequest.com. Using the site, anyone can draft a request for public records, and Conant and his crew take it from there, steering the request to the right officials, following up to see that it garners results, then posting the information for all to see. 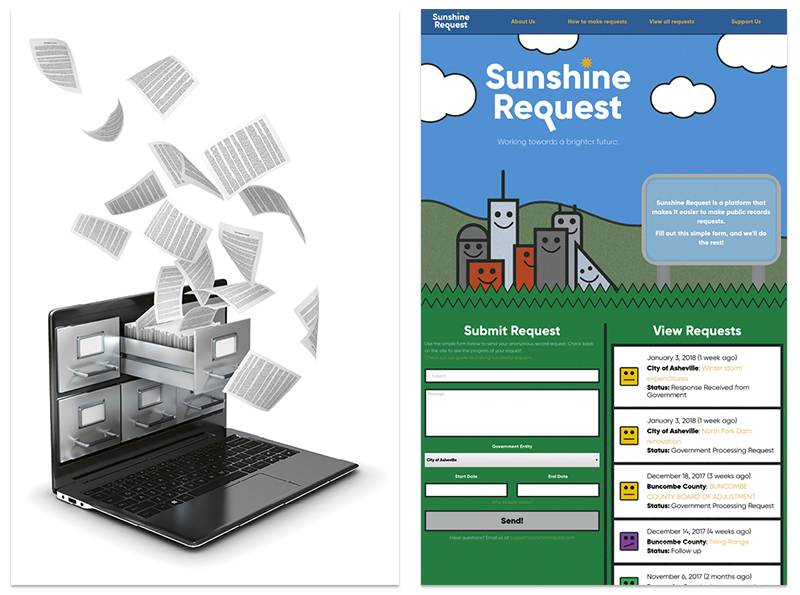 In just a year, Sunshine Request has facilitated more than 70 such requests and released rich troves of data about the inner workings of official agencies in Asheville and Buncombe County. Recent requests have covered everything from winter storm expenditures to dam repair information to domestic violence statistics.